When Can I Give My Newborn Food? A common question that parents often ask after the birth of their baby is, "When can I give my newborn food?" Once your infant arrives, be prepared for lots of unsolicited advice from friends, relatives, and even strangers. Some of the advice will be good, but you'll definitely need to learn to disregard outdated advice that may go against your pediatrician's recommendations. One of the often controversial subjects that you may encounter is feeding your baby. Well-meaning friends or relatives may tell you to begin giving your infant baby cereal through his bottle to help him sleep through the night. Others may advise starting your infant on solid foods at two or three months of age. These are two pieces of advice that you should not follow for a number of reasons. Your baby's digestive system may not be able to adjust to the digestion of solid foods without causing discomfort. Your infant should be receiving all the nutrients he or she needs from formula or breast milk in the first four to six months of life. With this information in mind, what is the answer to "When can I give my newborn food?" Actually, the only food you'll give your newborn will be breast milk or formula. According to the American Academy of Pediatrics, babies are ready to begin eating solid foods somewhere between four and six months of age. 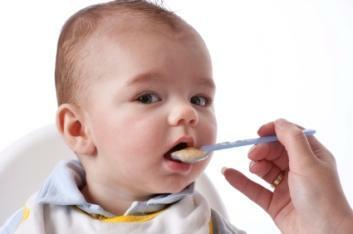 Until they reach this age, babies typically push their food back towards the spoon instead of attempting to swallow it. Once they mature a bit, however, they begin to master the concept of swallowing the food. By the time a baby reaches four to six months of age, he will be more active as well, making him more eager to try the new notion of eating. How do you know when your baby is ready to begin trying solid foods? He begins to master the art of chewing and swallowing. She can hold her head in a steady, upright position. He is able to sit up with support. Her activity level has increased, and she is clearly gaining weight. He shows an interest in watching other people eat. She has an increased appetite. Once you've determined that you can begin feeding your baby solid foods, what should you do next? Begin with one meal. Just because you eat three or more meals a day doesn't mean your baby should. Begin with one meal a day as you introduce solid foods. As your baby grows, you'll eventually cut down on the amount of breastfeeding or formula feeding sessions, replacing those with additional meals. In the beginning, however, the idea is to get your baby used to eating solids. He will still receive the majority of nutrients from breast milk or formula. Start out simple. Begin with rice, barley, or oatmeal cereal, and only try feeding a few spoonfuls the first few times. Once your baby grasps the idea of chewing and swallowing, you can move on to other foods. Introduce one new food at a time. To rule out any allergies, only introduce a new food every few days. After you've determined that your baby isn't allergic to that food, you can introduce the next one. Add strained fruits and vegetables. After you've begin feeding your baby cereal for a week or so, you can begin adding strained fruits and vegetables, one at a time. Follow up with meats. Meats should be introduced after fruits and vegetables. These should be pureed or extremely soft and diced. Answering the question, "When can I give my newborn food?" involves understanding what is best for your baby. While introducing solids is an important milestone in your baby's life, it is important to remember that she should be fed formula or breast milk for the first year. However, by the time she is approximately eight months old, she should be on a three meal a day schedule in addition to the formula or breast milk.